NRAO Home > Press Releases > Engine's Running But Where's the Fuel? Engine's Running, But Where's the Fuel? Astronomers have found a relatively tiny galaxy whose black-hole-powered "central engine" is pouring out energy at a rate equal to that of much larger galaxies, and they're wondering how it manages to do so. The astronomers used the National Science Foundation's Very Large Array (VLA) radio telescope and optical telescopes at the Apache Point Observatory to study a galaxy dubbed J170902+641728, more than a billion light-years from Earth. "This thing looks like a quasar in VLA images, but quasars come in big galaxies, not little ones like this," said Neal Miller, an astronomer with the National Radio Astronomy Observatory. In visible-light images, the galaxy is lost in the glare from the bright central engine, but those images place strong limits on the galaxy's size, Miller explained. Miller and Kurt Anderson of New Mexico State University presented their findings to the American Astronomical Society's meeting in Washington, DC. Most galaxies have black holes at their centers. The black hole, a concentration of mass whose gravity is so strong that not even light can escape it, can draw material into itself from the surrounding galaxy. If the black hole has gas or stars to "eat," that process generates large amounts of energy as the infalling gas is compressed and heated to high temperatures. This usually is seen in young galaxies,massive galaxies, or in galaxies that have experienced close encounters with companions, stirring up the material and sending it close enough to the black hole to be gobbled up. The black hole in J170902+641728 is about a million times more massive than the Sun, the astronomers say. Their images show that the galaxy can be no larger than about 2,000 light-years across. Our Milky Way Galaxy is about 100,000 light-years across. "There are other galaxies that are likely to be the same size as this one that have black holes of similar mass. However, their black holes are quiet -- they're not putting out the large amounts of energy we see in this one. We're left to wonder just why this one is so active," Miller said. Answering that question may help astronomers better understand how galaxies and their central black holes are formed. "This galaxy is a rare find -- a tiny galaxy that is still building up the mass of its black hole. It's exciting to find an object that can help us understand this important aspect of galaxy evolution," Miller said. J170902+641728 is part of a cluster of galaxies that the scientists have studied with the VLA, with the 3.5-meter telescope at Apache Point Observatory, and with the Sloan Digital Sky Survey telescope at Apache Point. 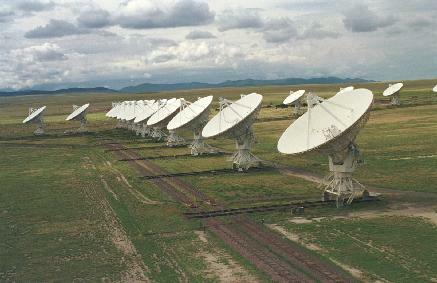 All these telescopes are in New Mexico. The National Radio Astronomy Observatory is a facility of the National Science Foundation, operated under cooperative agreement by Associated Universities, Inc. Apache Point Observatory is a facility of the Astrophysical Research Consortium which also manages the Sloan Digital Sky Survey.